Widely used in the Roof Cleaning Industry! WALK, RUN & HIKE with CONFIDENCE on Snow and Ice! 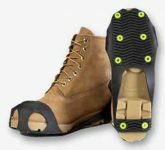 Get-A-Grip Ultra Due North Everyday G-3 Ice Cleats are ultra versatile for all your casual, dress or athletic footwear. Excellent during re-occurring freeze cycles (especially at the end of the season). 360 degree spike pattern provides more push off and lateral grip. The new Ice Diamond carbide spikes are integrated into the new open/close split rubber tread for improved traction. Exclusive Ice Diamond carbide spikes, with the patent pending nail head design, are molded into Dura plastic for longer wear and durability. Special rubber compound retains elasticity and fit in all temperatures. Durable and virtually unnoticeable while wearing! Unique support hole on heel strap provides easy adjustment — easy to put on and take off. Heel to toe safety. Includes a heel strap with two Ice Diamond carbide spikes to give better grip and durability.